As I’m currently on a bustrip for about 30 hours (from El Calafate to Bariloche), I have plenty of time to write this blogpost :-). After my first days in Patagonia, I had booked a flight from Ushuaia to El Calafate, my next destination. This was the start of a very tight but awesome schedule in which I discovered a beautiful part of Patagonia in one week. 6 Patagonia in one week – do or don’t? To be honest, I didn’t see much of El Calafate itself. I was just running around like a mad-man seeing everything around this town. But the one thing that gives me good memories about this place is the America del Sur Hostel . This is the hostel where I stayed (or at least paid to sleep a couple of hours) for 4 nights. I arrived at the hostel and I said: I want to see the Perito Moreno Glacier, El Chalten and Torrels de Paine National Park and I have 5 days. 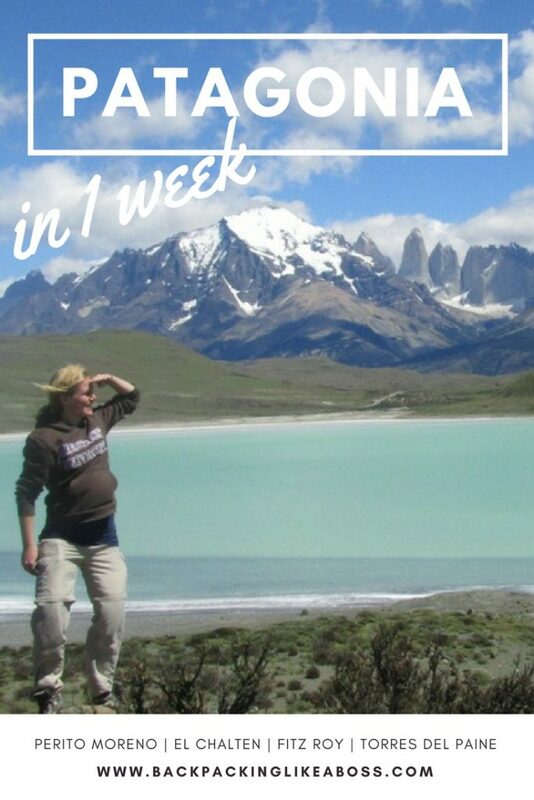 So basically: how do I see Patagonia in one week? The girl at the travel desk was simply amazing!! She helped me book all bustickets, tours and accommodation and I was set to go! I would go back to this place anytime, just because of the great service I got 🙂 After making all the plans, it was time to head of straight away for the first attraction! 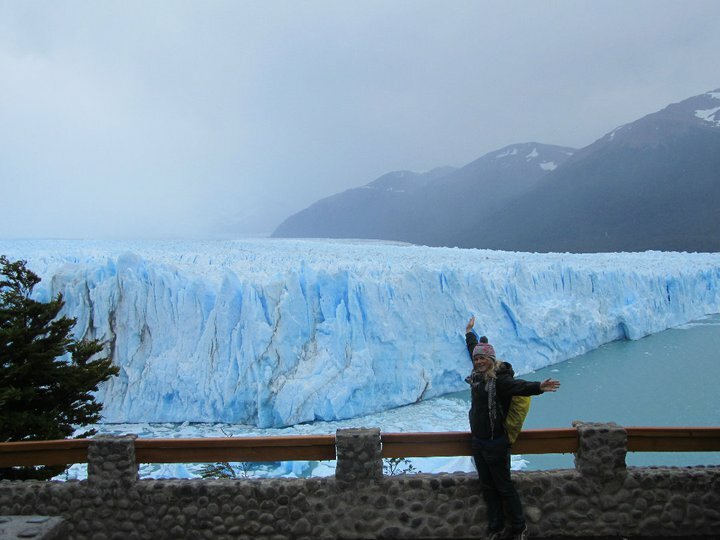 The Perito Moreno Glaciar is HUGE! 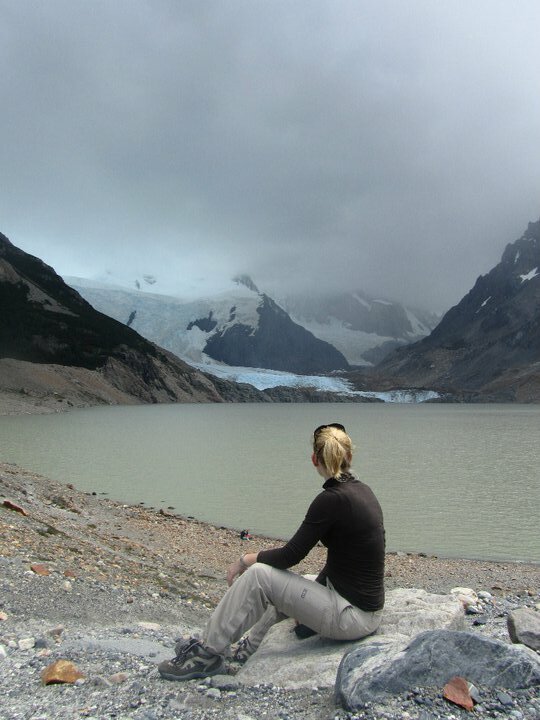 23rd & 24th of January – Next day, I took the 8am bus from El Calafate to El Chalten, Argentina’s trekking capital. 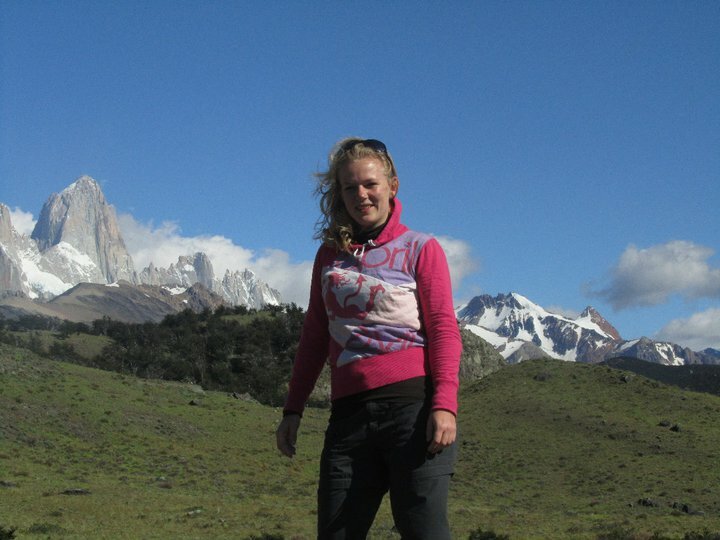 People go here to hike, enjoy the nature or to climb the famous Fitz Roy. 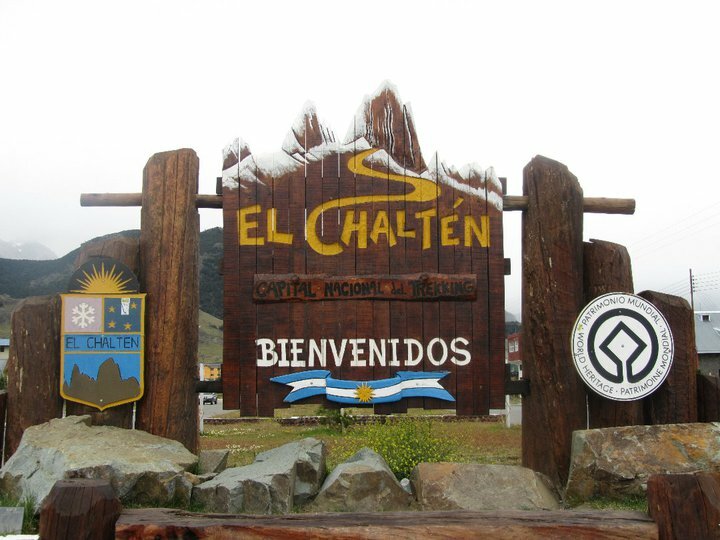 El Chalten is firmly positioned in my Top 10 South-America . A village where everyone walks on hiking boots, full of adventurers and such beautiful scenery around! I arrived at 11h30 at my hostel and at 12h00 I was on my way the to the trail that would lead to Laguna Torre. It was the first time I started a trek on my own so that was quite exiting. But it was amazing! I met a couple from Buenos Aires on the trek with whom I completed the trail to the laguna. The whole trek was a 22km round trip, but not very demanding. Even though not super demanding, it was very impressive! 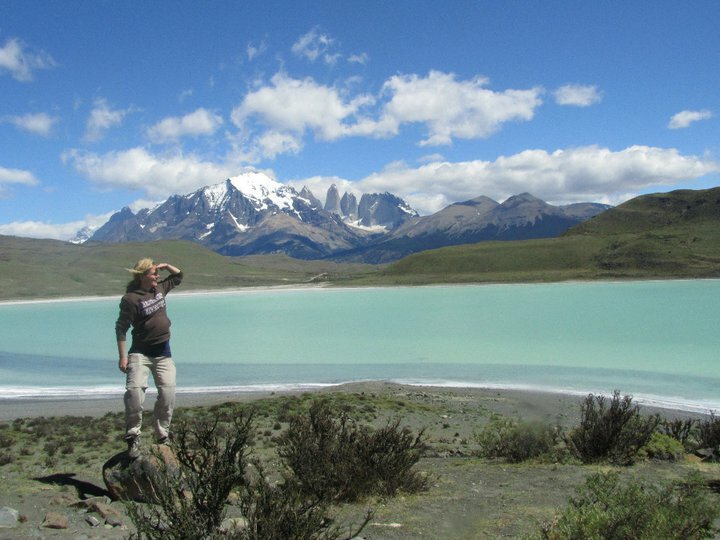 Laguna Torre is a grey laguna originating from the glaciar. The lake is surrounded by snow-capped mountains which gives it a mystical look. Unfortunately I did not have great weather but it was still easy to see the glacier. After a nice dinner with a new Chilean friend, it was an early night to get up early again to make another trek with a lady from France that I met in the hostel. We completed a trail that was about the same length as the previous one, but this one went up about 1000 meters in 3 hours! I was completely exhausted when we reached the mirador (viewpoint), but it was worth it. Fitz Roy had been completely visible for the beginning of the trip, which is really special as normally it has some clouds hanging around. So that was amazing! 2 days in the nature with great weather – perfect! After lunch, I took the bus back to El Calafate, where I spent another short night in the hostel where I had left my backpack as well. 25th of January – Again, an extremely short night. 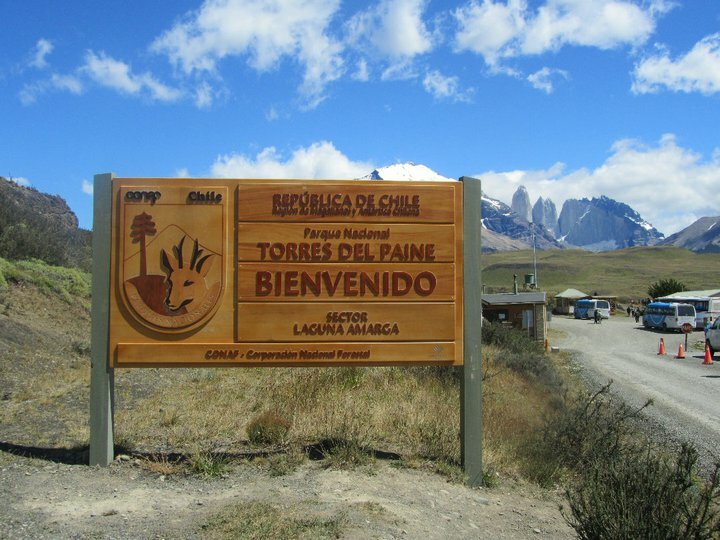 I had booked a daytrip to Torres del Paine national park in Chile. 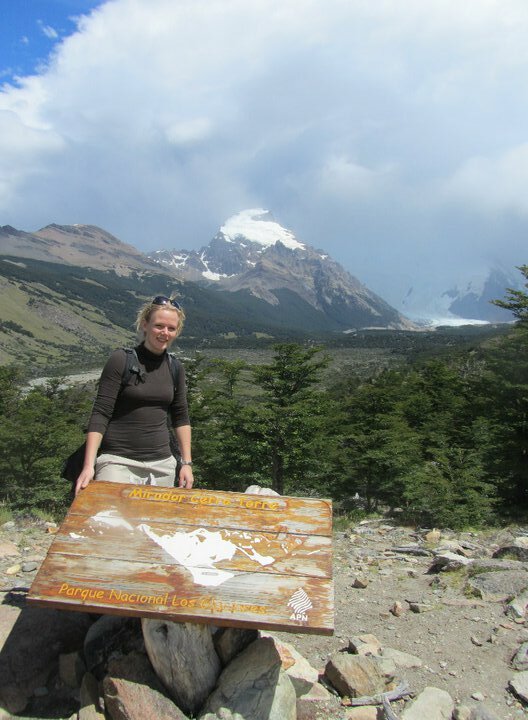 Initial plans were to go hiking the famous Torres del Paine W-trek for about 5 days. But with all the mess in Chile, inappropriate equipment and not so much confidence in my body yet that I could complete 5 days of hiking with a big backpack, I decided just to visit the highlights on a one day tour. With a nice group, we were extremely lucky again!! We left at at 05h30 and the first thing I noticed was us crossing the Argentine and Chilean border. Hooray!! We were actually able to see the famous Torres del Paine. These are the towers of the national park that are, just as Fitz Roy, usually covered in clouds. Good start of the day!! We visited the highlights of the park. Unfortunately mainly from the car, but it was alright as my legs were still recovering from the 45 kilometers from the past two days. Arriving back at the hostel very late, I ate some pizza with two Ozzie’s from Londen. I didn’t have a room anymore, as I had booked a bus out of El Calafate to Bariloche for 3am in the morning. But I was able to take a shower and get some rest, and then I shared a cab to the bus station with a lady from Buenos Aires. 26th of January – I decided not to take the (in)famous Ruta 40 as about half of it is still unpaved and it has an overnight stop on the way to Bariloche. This Ruta 3 is a bit of a detour, but has good buses, decent roads and no overnight stop. It was pretty comfortable in the bus, no one sitting next to me in a semi-cama seat that almost fully reclines! I was really looking forward to arriving in Bariloche. The city is situated next to a lake and is surrounded by mountains. I’ll probably do some more treks or some horse riding here. Patagonia in one week – do or don’t? Patagonia was amazing, and if I have the chance to come back I’ll certainly take one or two months to discover everything. If you don’t have another choice, do it this way but if you can, go longer! What I missed in this part of Argentina was the good weather (coming from Buenos Aires) and also everything was so incredibly expensive!! I had to skip some things, because all tours just cost so much. Northern-Argentina and especially Bolivia promise to be really cheap, so I’m really looking forward to that. In a couple of days I probably bus into Buenos Aires or Mar del Plata (couple of hours south of Buenos Aires) where I meet up with some people I met earlier on the trip. After Buenos Aires I will go on to Mendoza, Cordoba, Tucuman, Salta and enter Bolivia. Don’t likes: Fernet, the prices in Patagonia!! Pin this post to one of your Pinterest boards to come back to it anytime! Fernet was ook niet mijn favo. Maar dulche de leche raak je aan gewend, en alfajores zijn super lekker! ( maar alleen in Peru) . Empanadas zijn super goedkoop in Salta ( daar komen ze ook vandaan) Ik was ook echt verslaafd daaraan. Hey kanjer: in 1 woord WOW!!! Ik ben erg trots op je en net zo blij als jijzelf dat je een nare periode van GB hebt afgesloten. Compliment, je hebt er inderdaad hard voor gevochten. Je treed helemaal in onze voetsporen! Nog héél veel plezier toegewenst!